Animal Wildlife | Centipede | The centipede is a speedy, carnivorous invertebrate that is found generally around decaying matter all around the world. 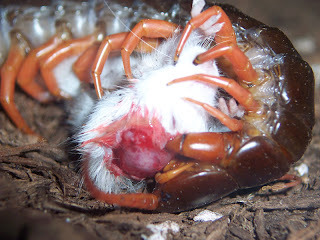 Centipedes are not only carnivorous animals but the bite of the centipede also contains venom which means that the centipede kills it's prey before eating it. 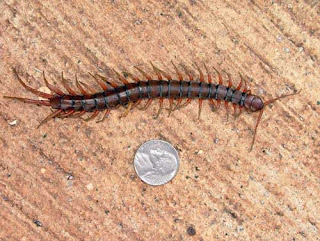 Despite their name, and the common conception that a centipede has 100 legs, this is in fact not true. 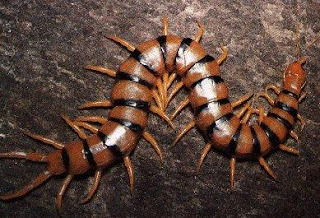 The centipede has pairs of legs that run the length of the body of the centipede, which are normally between 15 and 30 pairs of legs in total and not 50. There are thought to be around 8,000 species of centipede worldwide, although only about 3,000 have actually been properly documented and undergone intense studying in the scientific world. The centipede can be found worldwide and has even been spotted inside the Arctic Circle. 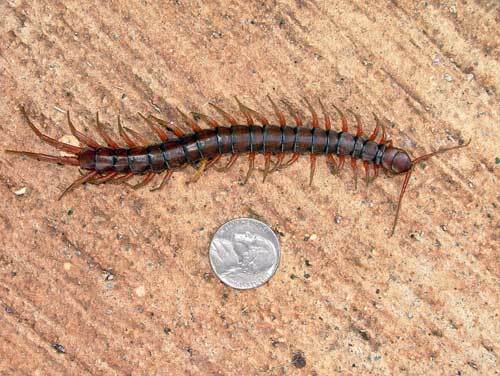 The centipede can range in size from a few millimetres to 30 cm long. 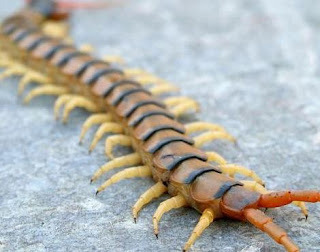 The centipede has a bite that will be painful to humans but not fatal unless the human is allergic (like with wasp/bee stings). 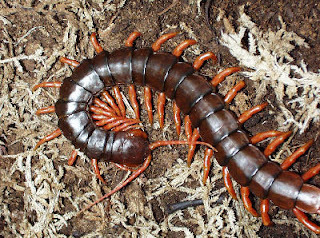 The centipede is usually found on land in moist habitats usually under rocks, leaf litter, logs and occasionally in burrows in the ground or rotting wood. The centipede favours damp environments and so is rarely found in the hot and dry desert regions. 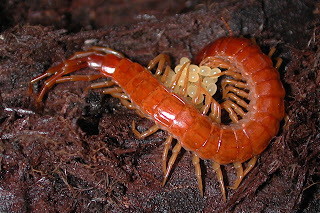 The centipede is one of the most dominant predators of the insect world, having claws on their first body segment is one of the centipedes noticeable traits. The centipede is a carnivorous animal and is therefore a pure meat-eater. Centipedes mainly prey on insects, spiders, earthworms and other small invertebrates although some large species of centipede have been known to prey on small mammals and reptiles. The centipede has a number of predators in it's natural environment although all the animals that generally prey on the centipede are relatively small. Birds, toads, frogs and small mammals such as shrews and mice are the most common predators of the centipede. The centipede is also seen by humans in certain cultures. Female centipedes lay an average of 60 eggs per clutch which are coated in a sticky substance for protection. The female centipede usually buries her eggs in the soil and some species of centipede are known to nurse their eggs and baby centipedes but not all. The centipede is one of the oldest animals on Earth having evolved into the form it is today, millions of years ago. The centipede has been found in fossils dating over 400 million years old.